If you see fresh young ginger at a market, this is a must-try recipe to enjoy the wonderful aroma and spicy flavor of fresh ginger. Give a quick rinse to rice under running water and strain it through a colander. In a medium sized dutch oven or pot, add in rice, water, sake and salt. Stir the liquid. Place the dutch oven over high heat. No lid is needed. Stir occasionally to avoid the rice to stick at the bottom. Once the water boils, then put the lid on and turn the heat down to simmer. Cook for 12 minutes and turn off the heat. Do not open the lead yet. The rice is still cooking. Wait another 15 minutes. 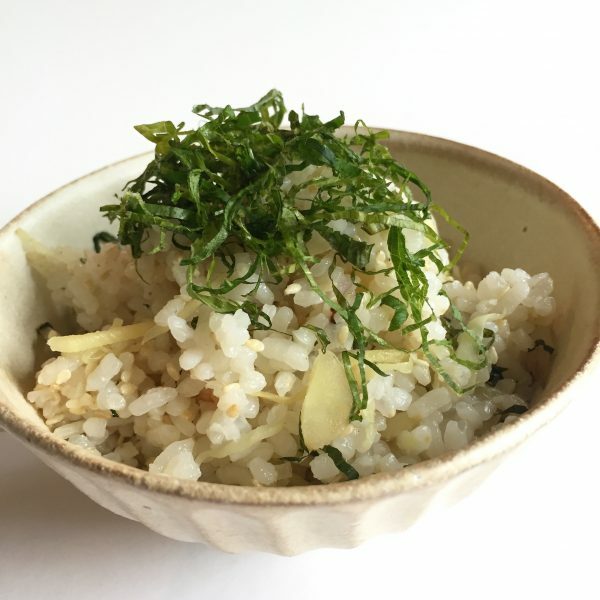 Open the lid, add the shiso leaves and fluff the rice.